This article is about Daiei Film. For Daiei, see Daiei (disambiguation). Daiei Film Co. Ltd. (Kyūjitai: 大映映画株式會社 Shinjitai: 大映映画株式会社 Daiei eiga kabushiki gaisha) was a Japanese movie studio. Founded in 1942 as Dai Nippon Film Co., Ltd., it was one of the major studios during the postwar golden age of Japanese cinema, producing not only artistic masterpieces such as Akira Kurosawa's Rashomon and Kenji Mizoguchi's Ugetsu, but also such popular film series as Gamera and Zatoichi. It declared bankruptcy in 1971, and was acquired by Kadokawa Pictures. Daiei Film was the product of government efforts to reorganize the film industry during World War II in order to rationalize use of resources and increase control over the medium. Against a government plan to combine all the film studios into two companies, Masaichi Nagata, an executive at Shinkō Kinema, pressed hard for an alternative plan to create three studios. His efforts won out and Shinkō Kinema, Daito Eiga, and the production arm of Nikkatsu (the Nikkatsu theaters did not take part in the merger) were merged in 1942 to form the Dai Nippon Eiga Seisaku Kabushiki Kaisha, or Daiei for short. The novelist Kan Kikuchi served as the first president, with Nagata continuing as an executive. Daiei's studios were located in Chofu, Tokyo and in Uzumasa in Kyoto. Nagata became president in 1947 and, apart from a brief period when he was purged by Occupation authorities, remained in that position until 1971. Under his reign, Daiei produced Akira Kurosawa's Rashomon (1950) and entered it in the Venice Film Festival, where it won the grand prize and became the first Japanese film to win an international award, thus introducing Japanese cinema to the world. Daiei also produced Teinosuke Kinugasa's Gate of Hell (1953), the first Japanese color film to be shown abroad, earning both an honorary Academy Award for Best Foreign Language Film and the Palme d'Or at the Cannes Film Festival. Daiei also produced such renowned films as Mizoguchi's Ugetsu (1953) and Sansho the Bailiff (1954), as well as Jokyo (which was entered into the 10th Berlin International Film Festival). On the popular front, Daiei was also known for such successful film series as the Zatoichi films starring Shintaro Katsu, the Sleepy Eyes of Death series featuring Raizō Ichikawa, the Gamera movies, and the Daimajin Trilogy. Daiei also produced many television series such as Shōnen Jet. 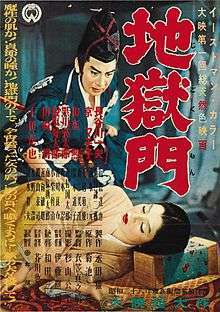 In its heyday, Daiei featured such talent as the actors Raizō Ichikawa, Shintaro Katsu, Kazuo Hasegawa, Fujiko Yamamoto, Machiko Kyō, and Ayako Wakao; the directors Kenji Mizoguchi, Kon Ichikawa, Yasuzo Masumura, and Kenji Misumi; and the cinematographer Kazuo Miyagawa. Like some other film studios, Daiei had its own professional baseball team in the 1950s, the Daiei Stars, which later became the Daiei Unions. These teams eventually became the Chiba Lotte Marines. Suffering from Nagata's profligacy and an industry-wide decline in attendance, Daiei tried to stay alive by teaming up with Nikkatsu, but eventually declared bankruptcy in December 1971. Members of the union, however, succeeded in getting Yasuyoshi Tokuma, the president of the publishing house, Tokuma Shoten, to revive the company in 1974. The company continued as a producer making only a small number of films, some of which were big budget spectaculars like the international co-production The Go Masters (1982), art house hits like Shall We Dance? (1996), and genre films like Kiyoshi Kurosawa's Pulse or Takashi Miike's Dead or Alive films. Following the passing of Yasuyoshi Tokuma, Daiei Film Co. was sold to the Kadokawa Shoten Publishing Co. In November 2002, Chairman Maihiko Kadokawa announced that Daiei Film Co. would merge with the company’s own film division, Kadokawa Pictures to form Kadokawa-Daiei Film Co. Ltd.
1 2 3 Shoemaker, Greg. "Daiei: A History of the Greater Japan Motion Picture Company". The History Vortex. Retrieved 29 December 2011. ↑ "Nagata Masaichi". Keizai ketsubutsu retsuden. Jabira. Retrieved 29 December 2011. ↑ "Master director dies". BBC News. 6 September 1998. Retrieved 29 December 2011. ↑ "1954: Best Foreign-Language Film". All about Oscar. Brittanica. Retrieved 29 December 2011. ↑ "Awards 1954". Festival de Cannes. Retrieved 29 December 2011. ↑ "IMDB.com: Awards for Jokyo". imdb.com. Retrieved 29 December 2011. ↑ "Kadokawa Company History 2002(H14)" (in Japanese). Retrieved 30 December 2011.